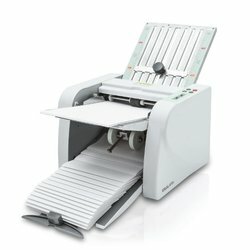 The affordable compact folding machine for four fold types and stream delivery paper ejection. Easy setting of the fold stops on the two folding plates with fold symbols and colour code indications. Automatic power cut-off with indication on display if top cover is opened. Automatic shut off when the last sheet is folded. Easy operation via start and stop push buttons. Digital display with error indication. Digital counter (addition/subtraction). User friendly test mode: 2 sheets can optionally be folded beforehand for test purposes. Stream delivery paper ejection system conveyed by belts and three manually selectable ejection roller positions. This product was last updated on Wednesday 20 February, 2019.